By outright telling us that Game of Thrones will end on the sixth episode of its eighth season, perhaps showrunners David Benioff and D.B. Weiss have made a fatal error. While it's somewhat nice to have an end destination marked out for us, this satisfaction comes hand in hand with a sense of urgency and entrapment - if the show takes too long doing something now, it can't exactly just make more time for itself further down the line anymore. It creates the impression that, with just thirteen episodes left before the credits roll for good, Game of Thrones needs to come out like a speeding bullet and get things moving, quick. "Dragonstone", the show's seventh season premiere, has no such desire. I'd make a comfortable argument for this being the slowest and least eventful premiere Game of Thrones has served up to date. Not a great deal really happened, far too much time was spent with supporting characters that don't really need the spotlight anymore, and there's a general lack of narrative momentum plaguing essentially every plotline the episode oversees. And yet, "Dragonstone" simply oozes confidence. Even if not much is actually unfolding before us, it's tough not to be impressed by how assured Benioff and Weiss are in what they're doing. A lot of what this episode does wrong is frustratingly predictable, but most of what it does right is satisfyingly reliable. It's an episode that seems to know what it wants, but the more you dig around inside the less that feeling might stick. 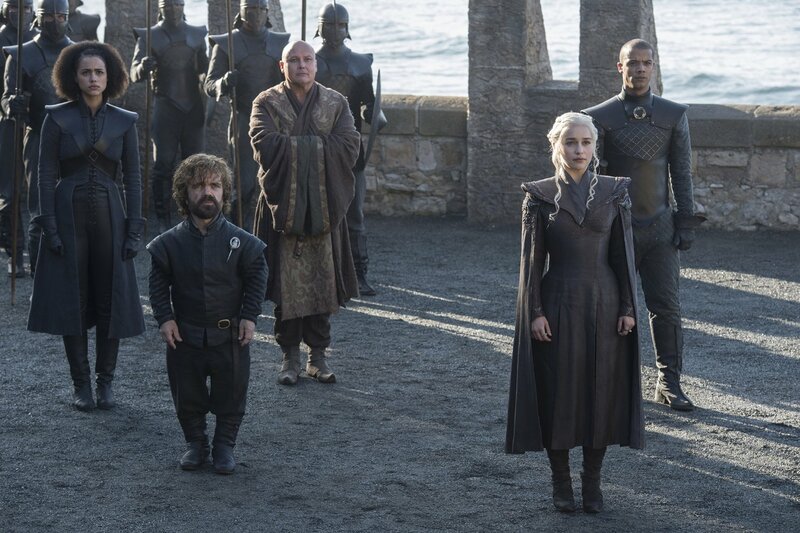 Much like some of Season Five's strongest episodes, "Dragonstone" finds a nice thematic thread to link most of its separate parts. The episode touches on the idea of wanting something that's out of reach, but more predominantly it looks at people returning to an old place in a new light. The Hound, for example, winds up back at that little old house he robbed a few seasons ago, only to find the occupants now dead, having starved to death. Would they have survived for much longer even if he hadn't stolen from them? Who's to know, but it sparks something in Clegane. The episode isn't exactly subtle with how it handles this - it's probably no coincidence he gets his first vision in the flames after one of his more emotional acts so far - but the change is there. Then we have Arya, returning to The Twins to enact vengeance on the Frey soldiers who massacred her family at the Red Wedding. The scene immediately feels out of place for reasons I highlighted in my review of the Season Six finale (namely that it jarringly forces Arya onto a different narrative speed than everyone else), but it's tough not to be at least somewhat thrilled by simply seeing a Stark take revenge against a Frey army. Granted, that's due more to the work put in by earlier seasons than this episode, but the thrill is there nonetheless. The issue is that the episode's script is frustratingly unwilling to really explore any of this. We already know Clegane is on a new path - his moments with Ray back in "The Broken Man" sold that rather nicely - so this retreading of the same ground, as nice as it is, feels meaningless. The same can be said for Arya, after wiping out a Frey army and walking away with a smile, the next time we see her she seems to have forgotten all about it. It all works on surface level, but Game of Thrones used to relish in character detail. Now it seems more content to offer cheaply effective moments and then hurry on to the next scene. "Dragonstone" also spends a frustrating amount of time at the Citadel with Sam. If it isn't disappointing enough that his first scene feels like it's aiming for a sense of humour well below the show's target audience, it's even more underwhelming to find that the whole thing builds to a reveal that plays more like setup than a real development. There's fun to be had here - Sam and Gilly remain one of the show's most enjoyable character pairings - but a sense of wasted time hangs over our minutes at the Citadel like a guillotine. This close to the finish line, Game of Thrones needs to pick and choose which characters we spend our time with - this felt like a poor first decision. The episode isn't all bad, though. When "Dragonstone" stops milling about with inconsequential side characters it finds some genuinely interesting stuff. Cersei and Jaime Lannister, for example, begin their scheming for the wars to come. The scene itself perhaps lacks the visual flair we've come to expect from Game of Thrones - especially disappointing when they have the conversation walking on a floor sized map of Westeros, that's just begging for some beautiful cinematography that director Jeremy Podeswa ultimately doesn't offer - but the dialogue between the two is as strong as ever. Cersei's delusion of her own ruling comes to the forefront, Jaime reminds her of their tricky situation. By the time Euron Greyjoy is making marriage offers, we have a sense of progression and momentum - something we can follow through on, a genuine narrative thread. The same can't be said for Arya or Sam or the Hound. Wrapping up with Daenerys, Tyrion and co. arriving in the episode's titular city feels appropriate. Aside from the stunning set design on display, there's something compelling about the near wordlessness of the sequence. It's a testament really to the strength of the show's history that we can arrive at the city and feel what Daenerys is feeling all without anyone verbally telling us anything - especially when Game of Thrones is somewhat renowned for its overwhelming exposition - but that shouldn't detract from the way "Dragonstone" handles the scene. It's gorgeously shot, and following Daenerys from beach to bridge to battle room is pretty damn awesome. The Queen is home, but it's what she does next that should really get the blood pumping. The episode essentially all comes down to a battle between characters doing predictable things in uninspired ways and characters reliably on form and doing what we'd expect of them. It's a tricky line to walk, but the latter is always better than the former and it's a balance "Dragonstone" doesn't always get right. Hopefully next week will begin to explore what the near future might hold for all these characters, as well as how they actually feel about it, as right now Game of Thrones is getting away with doing the bare minimum - and for a show in its penultimate season, that isn't really good enough. Arya as a character is surely beyond salvation now. After her storyline was so horribly butchered over the last two seasons, it's increasingly confusing now to see her still using her Faceless Man training after she reclaimed her identity. It feels like the logical thing for her to do, but it makes "No One" an even clunkier episode than it already was to begin with. I've never been a big lover of the Hound, so if this season spends a lot of time with him I'm probably going to struggle. His internal conflict has never really registered with me, and his humour has always felt forced and engineered. His scenes tonight were no exception. Jon and Sansa also tied in nicely with the episode's concept of returning to an old place, as they first begin to navigate Winterfell and the tricky politics of the North post-Ramsay. Sansa just wants Jon to listen to her and to trust her, she knows what Cersei is like and how she operates. Jon and Sansa are very different people with very different mentalities when it comes to this, so it should be interesting to see what the show does with them moving forward. Bran and Meera arrive at Castle Black, which hopefully means Meera gets to stop carrying Bran around on a sledge. Her poor spine.